I’m not sure whether it’s the veal in my stomach, the créme anglaise on my tongue, or the wine (after dry January) in my blood, but I couldn’t be happier. Would it be too much to say verklempt? I don’t think so; but again, the wine. I just finished assisting the first class of Shelley’s four-part French series. French cuisine, unlike any other, puts so much effort into subtlety. 4 quarts of veal stock gets two cloves. One wouldn’t be enough to taste and three would be too strong. Those cloves, a bouquet garni, tomato, and garlic get simmered with roasted veal knuckles and mirpoix overnight (at least 8, no more than 16 hours). Neither a boil nor still, the simmer is as gentle as possible, a bubble rising to the surface only every minute pour faire sourire le put-au-feu...to make the pot smile. (“Where soups are concerned the English language is poor, and cold, and halting; the speech of France alone can honor them aright,” Elizabeth Robins Pennel, The Delights of Delicate Eating, 1901). This stock, virtually without fat, we then used to prepare French Onion Soup. Slow cooked onions and foresty thyme were made one with the rich clear stock. A grassy-sweet foundation for the true star of any French Onion: the flotilla of crouton, crisped edges hidden under a blanket of gruyere. Following the soup, we had Blanquette de Veau. A white stew in which no ingredient is allowed the flavor-enhancing privilege of browning. 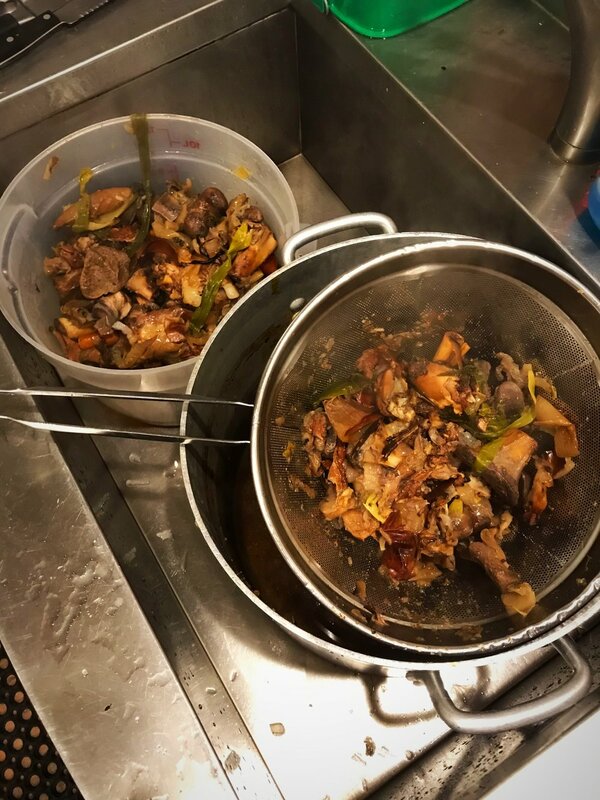 From skeleton to stock to stew it takes around 19 hours to make, time and technique supplying the flavor where Maillard is rejected. And like other French stews, what seems like half of that time is spent peeling the obligatory pearl onions. The result, worth every minute, coated one’s tongue with a velvety sauce, leeched from cubes of toothsome veal. As diners, we didn’t (because we couldn’t) reflect the subtle refinement of the dish, sopping up every morsel with crusts of bread and, even then, licking what remained straight from our bowls. But tonight was more than a celebration of French technique and flavor, as incredible and delicious as it is. If the food was subtle, the feeling in the room, the excitement and conversation, were anything but. Our guests, recently married and couples of 25 years, new and soon-to-be grandparents, software engineers, sailors, and one videogame entrepreneur, exuded enthusiasm. Enthusiasm for food, for wine, and for the company of others who share that enthusiasm. Undetectable in the evening’s joie de vivre though, was one couple’s life-changing news, shared with us only after the lights had been dimmed and candles lit for dinner. He had recently received a stomach cancer diagnosis. Their visit to the school, among other recent gastronomic adventures, a celebration of all that they loved before the unknown of surgery. Before the inevitable appetite loss. Before things would change forever. They loved food. During chemo sessions, between each successive injection, they’d consume a true Jersey progressive meal: broccoli rabe and parm between the first and second transfusion, soppresetta hero after the third, Caprese before heading home. We’d have never known had they not told us. He exuded positivity. The two of them were so happy to be here, to share in food and drink with friends. Friends they’d come with and those newly acquainted. They showed me that eating well and sharing a table, is to love the best in life. Don’t miss out while you can. So, I suppose it’s neither the veal, nor créme anglaise, nor wine (okay, maybe partly the wine), which leave me feeling so happy and inspired. Tonight’s meal reminded me why what we do is so important. The school, the farm, and this space are all about creating a community. And whether you’re here long term, or only for a dinner, that’s always what you leave with.